THE CATALYST A Student Publication of New College It's not the size of the boat it's the motion in the ocean. 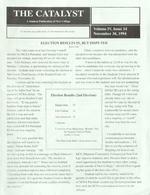 Volume IV, Issue 14 November 30, 1994 ELECT IO N R ESULTS IN, BUT DIS PUTED Kate Fink The votes came in at last Tuesday' runoff election for NCSA President, and Sujean Chon was declared the winner, receiving 85 out of 166 vote ca t. John Graham, who received the most vote at Monda) 'selection, is questioning the fairness of the election Graham ent a note conte ting the election to eil Isr ael, Chief Justice of the Student Court, on Tuesda_ November 22. Gra ham said he wa conte ting the election on the ground. of "electioneering at the ballot box" by an Chon, a surpri e write-in candidate, said he decided to run because she was di ati fied with the other two candidates. "I went to the ballots at 12:30 to vote for the write-in candidates that everyone was promising to be there ... when I found the same two candidates ... I decided it would be in the [student '] be t intere t if someone who had experience with the administration and wa clo e to the student. and was not graduating thi year would run." Chon left her ID card at the voting unname d CSA officer. The Elect i on R es ul ts (2n d Electio n ) table. Though 68 votes had already been ca t, she re ceived 44 votes by the end of is ue will go to Student Court this w ck. "It was poorl y handled from start to finish," Graham aid of the election. He felt it was not well publicized, and that some Sujean Chon 85 John Graham 40 Trir Linnerooth 29 7 abstains the day, tying with Trip Linnerooth for second place. Graham received 55 votes, not a majori ty; a "runoff" election wa held the next day. tudcnt did not even know that current NCSA President Ed M ')Ore wa stepping down 5 write-ins (Ivan Magileway, "Roman", Fee the Squirrel, Parlick olan, Ashley Colvan) ''I would like to see more communication between faculty and student .. I'd like to ee the campu e of Ringling Art School and ''It's very possible that the election will need to be rerun, Adam Stone, SAC "The Man in the Mask" received no votes. cha1r. said last Tue day. ''All we 1ave going on this is a message on Mark Johnson's desk. from Neil [I rae!] that said. 'The election is challenged. what do I do?"' Stone said he doubted t.lcre wa-; grounds for contesting the election, even if election procedure had not been followed completely. "Deviating from code does not neces. arily mean that it \\ ould be rerun. It's up to the Student Court to decide whether or not the breach of code ju tifies rerunning the election ... MCC [Manatee Community College] and New College improve relations, also, because there i uch a small opportunity for students to meet other young people outside of New College.'' offered Chon regard ing her goals if he does take office. Graham said he has recently added to hi agenda of what he would like to get done in the office of CSA President: examining election procedure and how well the NCS constitution is known by its officers. 2 The Catalyst November 30, 1994 Editorial The NCSA Presidency is a fairly thankless job. It involves long hours and much work, while a fair number of people are after you about what you should or should not be doing. otice how few tudents actually want l<"><"<'nt st" Staff Writers: Graham Strouse Rocky Swift Jake Reimer, Kate Fink Nick Napolitano and Kristina Rudiger Layout: Kelcey Burns and Michael Hutch Business Managers: Gary Smith and Anjna Chauhan The Catalyst is also available on-line at http://www.sar.usf.edu/-reffell/catalyst/catalyst.html Direct inquiries/submissions to our Computer Guy, James Reffell (reffell@ virtu.sar.usf.edu) Co-Sponsored by Dean and Warden Michalson and Professor Vesperi Printed at Bradenton Quick Print Letters to the Editor should be submitted on disk if possible, if not then in type. to Box 139. the Catalyst envelope on the door of the Publication Room. or mailed to: 5700 N Tamiami Trail, Box 139 Sarasota, FL 34243 The Catalyst reserves the right to edit submissions for reasons of space or gra mmar. The Catalyst November 30, 1994 3 THANKSGIVING HOLIDAY Sara Foley This Thanksgiving, most students went home to family, friends, and a huge, home-cooked meal. I however, found myself outside the second-court lounge smoking cigars that tasted oddly like coffee and cherry flavoring. This followed a day of watching Clash of the Titans and some other movie with a belly dancer in a Mason jar who kept making an old man hallucinate about giant bees. Actually, I had a really good Thanksgiving The New College campus was officially dead at 7: I 0 p.m. last Wednesday evening when I stumbled into Ham Center searching for food and found the building to be dark, empty, and silent. Those of us who stayed on campus over Thanksgiving break found ourselves "roughing it" without a cafeteria or a C store. But we weren't bored; most of us had plenty of work to do At least no one went hungry on Thanksgiving Day; huge dinners were held in both B-dorm and the second court lounge. Many people had spent the day preparing turkey, potatoes, and other traditional fix in's and by dinnertime about twenty or so of us Pilgrims found ourselves in the lounge faced with more food than we could ever hope to devour. The scene was similar in B-dorm, where both on and off-campus students had chipped in to fix a feast of their own. Thanksgiving Day turned out as it was meant to be-a bunch of people gathered together to share drinks food, and laughter. We made a toast to good friends and good eats, and then we sat down and made gluttons of ourselves. There was no stuffy family dinner conversation here; instead we talked about lots of silly things like the Cindy Crawford jewelry collection and makjng a road trip to see the Kentucky Derby in May. Two bottles of wine and many cigarrettes later we found ourselves completely sated and sleepy, and too stuffed to move. But one by one we began the task of cleaning up the kitchen and dividing up the leftover food. Then we left, groaning about our full bellies and promising to do it all again next year. As I went back to my room, the campu suddenly seemed very quiet and empty all over again. But this wasn't a bad thing; the night seemed very peaceful. I wa ready to spend the rest of it playing Tetris and writing a paper-my first Thanksgiving away from home had turned out well, after all. OUTSIDE THE IVORY TOWER Jake Reimer More Fighting in Bosnia Serbs moved into position last week to overrun another Muslim town in Bosnia By Saturday. Serbs had closed to the edge of the town of Bihac, one of several Muslim enclaves created and supposedly protected by NATO. The Serbs appar ently were undeterred by NATO air strikes that had damaged Croatian Serb airfield runways. but nothing else. And from the conservatives ... "No thing in this Constitution shall be construed to prohibit individual or group prayer in public schools or other institutions. No person shall be required by the United States or by any State to participate in prayet: Neither the United States nor any State shall compose the words of any prayer to be said in public schools." -A version of the proposed constitutional amendment that would allow prayer in school. Our desire to restore the centrality of the family will take place over decades, not years." -Ralph Reed Christian Coalition leader and family advocate. "No, I do not. And neither do the people in the armed forces." -Senator Jesse Helms responding to the question of whether or not he thought President Clinton was "up to the job" of Commander in Chief. Hi-de-hi-de-hi-de-ho ... Cab Calloway, the energetic singer who gave up law school and turned down an opportunity with the Harlem Globe Trotters to pursue his music, died last week at the age of 86. Mr. Calloway is probably most famous among the younger genera tion for his role in "The Blues Brothers" and his song, "Minnie the Moocher". Would you like fries with that? A scientist at the University of Pennsylvania announced last week that he has developed a technique that may open the way to inheritable genetic alterations. All gene therapy done so far has involved the alteration of somatic cells, cell that die when the body dies. However, Dr. Ralph Brinster's new method involves manipulations of sperm-producing cells in mice called stem cells; these cells then have a direct genetic impact on an individual's progeny. Many ethical concerns have been raised by the new technique, which could theoretically allow manipula tions of a human child's genome a Ia Huxley's "A Brave New World''. 4 The Catalyst ovember 30, 1994 ANNOUNCEMENTS Professors Terry Palls and Jane Stephens will be reviewed in early January 1995, as part of the regularly scheduled reviews of faculty. The PAC assessment will include. among other things. an evaluation of the faculty member's teaching, scholarship, and communitY mvolvement and contribution If your knowledge extends into these areas. we would appreciate your comments. The infom1at10n seek ts not stmply a "for or against" vote, but rather a critical evaluation. We need your lellers as soon as possible: all letters must be IN THE FILE BY 5:00PM, JANUARY 7, 1995 hut MAIL NOW AND AVOID THE CHRISTMAS RUSJI. In accordance with the Board of Regents policy, letlers wtll be liled in the Provost's Personnel Records for facu lty members and wiJI he available only to authorized indi' tduals (including the person about whom the letter is written). and of course to PAC members. We cannot usc anonymous letters. PLEASE sign vour letter. :\II letters should he sent to Peter A. Kazaks. Division of atural Sctcnces. * Help!! We are two thesis students who need volunteers to participate in our thesis projects. Time. 2-3 pm Friday Decemher 2nJ. We'll have food and dnnk!>-a/Ill CASH!! We really need )OUr help-we can't do the projects unless we have enough p;lrlt<:tpants. And we need to know as as posstble. If you can help. please contact one of us: Sebastian (hox 352. phone: 366-9042) or Ra) monda (box 231) *;. :: The Campus Bike Shop is open Thursdays and from 12 noon to 4 pm. in Parkview House Garage. The Bike Shop sells helmets. hghts. locks. and all sorts of other accessories as weJI as repairing aJI makes and models of b1cycles. * Self-Esteem and Self Confidence: Where did it go? Just when you re feeling stressed to the max. your self-confidence gives out! Is there a way to get through all Counseling and Wellness Center presents a workshop facilitated hy \1arcy Stern. :-vt.A .. Ed .. Tuesday. December 6, 7:00pm-8:30pm. * ISP: The Center lor Service-Learmng is looking for students imcrested in an ISP interneship at Gulf Coast l.egal crvtces Homclessness Prevention Project. Work directly \\ith and lawyers. Keep people from being evicted. Make a real difference in real ltvcs Contact Am) StulL at 359-8009. or box 421. * Campus police would like to nottfy students that they have issued and will issue tickets to students who run stop signs along Spaall .. Students are urged to dnve carefully at all times. The police state that while they do not want to penalize students. tt is a matter of safety a nd obeytn!! traffic regulattons .. POLICE LOG ll/13: 3: lOam-Ofc. St. John gave four individuals trespass warmngs m the Pei dorm area. 4 13am -There was an internal noise complaint and th e wall was shut down. 11/16: X:20am The Crossroad. Cafeteria ..;ign was reported tolen from uuhtde the cafetena and .. NCLF. was painted in its place. !0:04am -A non-LSF male was in\ tted to a class by a professor \\ohO had knO\\ ntm a\ a tudent I 2 years earlier. When the man began to be disruptive he was g1ven a trespass warmng and escorted off campus on loot by Oft.. Walker. Later in the day, an untdentificd man fitting the descnplton of the trespas er walked into another classroom and Lltsrupted the class. He left before police were able to tdenttf} hun. ll/19: I :37am A non-USF student was arrested hy Sgt. Shideler for underage posses i on of alcohol and obstruction He 'booked and jailed''. 5:30pm A 72 year old man attending a wedding i n College Hall fell and broke his hip. Emergency services veh icles responded and took him to a hospital for treatment. II :56pm -Sgt. Shtdeler caught a student who was under rcstncttons from student affairs violating those restr i c tions. 11/20: 1.52am -Ofe. Mislyan arrested two students for underage possess ton of alcohol: they were gi vcn not tee-; to appear m court. 2:00am -Sgt. Shtdelcr received an orr-campus noLT complaint and the wall was moved mto Ham Center.